HAPPY DONABE LIFE - Mrs. Donabe's Rustic Japanese Kitchen: Summer "Harusame" Noodle Salad with Kyoto-style "Awase-zu"
Summer "Harusame" Noodle Salad with Kyoto-style "Awase-zu"
This is another super quick recipe by using Kyoto-style "Awase-zu" vinegar seasoning. "Harusame" is Japanese bean thread noodles. 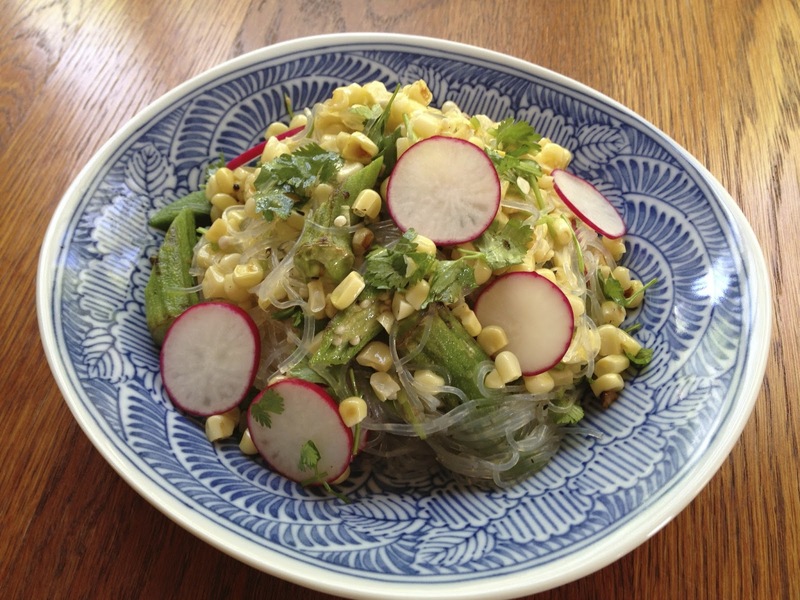 You can use other types of bean thread noodles for this recipe. When I make this dish for lunch, I simply mix in whatever I find in the fridge. Since I have corn and okra almost all the time during summer, they are my easy choices. But, you can make it with other kinds of vegetables or even seafood or meat, if you like. Cook harusame noodles according to its package instructions (I cook it slightly al dente). Rinse in cold water, drain well, and set aside. Cut the noodles if they are too long. In a small cup, combine the "Awase-zu" and fish sauce. In a bowl, combine the harusame noodles and "Awase-zu", and toss together. Add the rest of the ingredients and toss again. 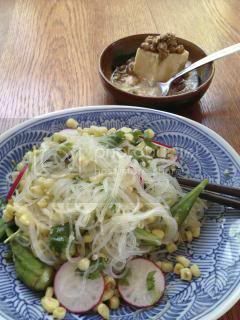 Lovely quick lunch, with a side dish of tofu, topped with homemade natto.